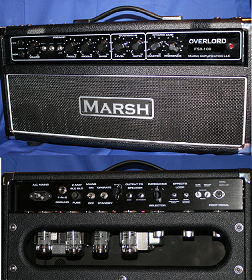 The Marsh 5E3NY Tweed 6L6 Amp Kit!!! This model has recently been redesigned with custom wound Mercury Magnetics Power transformers specially made to our specifications to provide higher voltages for the 6L6GC plates. More headroom, less muddy, louder than any other 5E3 6L6 available anywhere! As a huge Neil Young Fan one of the first amps i started building was the Tweed 5E3 with 6L6's. This makes the great classic Tweed amp a more powerful fatter sounding beast than the already awesome amp it is. Bigger Iron, tighter filtering and more power (approx 30 watts) to drive the speaker! If you need the more power for extra clean head room than the stock 5E3 provides then here's a great alternative for you. Comes standard with a Jensen C12Q ceramic or yo can upgrade to a Weber 12F150neo or Vintage 30 to make it the loudest 5E3 on the planet!!! NOTE: There is a manual for this kit, however, it is considered an EXPERT kit. You must be experienced in kit building to purchase this model.